Date and Time can be changed with the roller buttons. Moving them quickly accelerates their effect. Tapping on the left for the right side of a roller steps the date/time. Orange arrow points in the direction of the Sun. Shadow lines on the map indicate the azimuth (direction from True North) angles of Sun rise and set. The Sun is down when it is on the shadowy side of the lines. Rise and Set times are shown with their corresponding azimuth angles. Tapping the Rise and Set times switches to a display of the current Sun angle, height, and shadow length. Move the map and the rise and set times and angles are automatically recalculated. 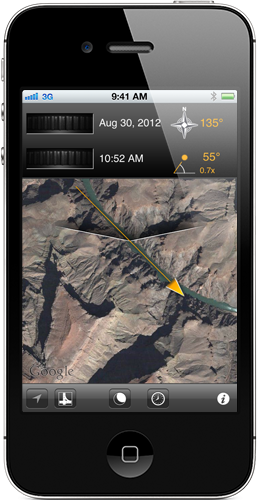 Use the location arrow button on the lower left to center the map at your current GPS location. The next button switches between Map and Satellite view. Switch between Sun and Moon calculations with the next button. Tap the clock button to use the current date and time for calculations. Tap the info button to access the help screens. Satellite view. Here we moved the time roller to find when the Sun would line up with the river. Answer: 10:52 AM for this date. Azimuth (direction from True North) angle of the Sun is 135°. The Sun is up 55° above the horizon. The shadow length will be 0.7x. That means that a pole 1 m tall will cast a shadow 0.7 m long. Moon information. The Moon will rise at 2:02 pm, and set at 11:52 pm on this date. Sometimes the set time is earlier than the rise time. The earlier time is always displayed on top. Some days the Moon may not have a Rise or Set time (since the rise/set is either the previous or next day). In those cases, it is displayed as None. Tapping the Moon Rise/Set times will switch to a display of the Moon position. Tapping again will show the Moon phase. 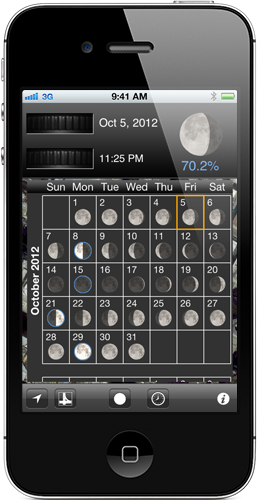 Tapping the Date brings up a scrolling calendar of Moon phases. Tapping again will make it disappear. The dates of New Moon, First Quarter, Full Moon and Last Quarter are outlined in blue. The current date is outlined in orange. Tapping a day on the calendar changes the Date. This can be a fast way to pick a date corresponding to a Full Moon, for example. Here the Moon is waning and 70.2% full. 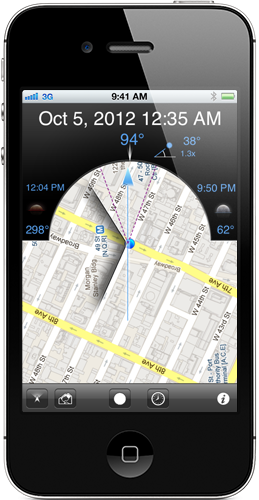 Tapping the compass location button (lower left) will center the map to your current location. Tapping it again will switch to compass mode as shown here. 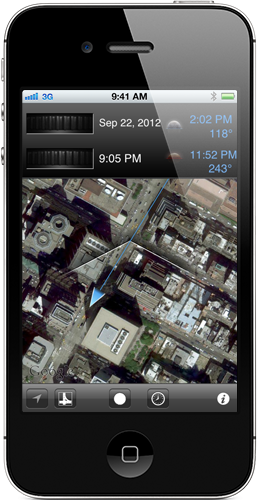 The map rotates as you rotate your device, to match the direction that you are pointing the device. The time at the top indicates when the Sun or Moon will be at the angle you are pointing. 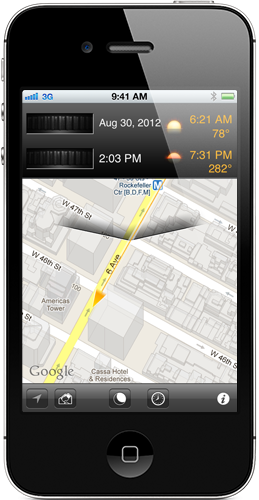 This lets you quickly find the time that the Sun or Moon will be at the angle you are looking for. Rise and Set times and angles are indicated to the left and right. The actual compass direction is indicated above the arrow. The height of the Sun or Moon is shown along with the shadow length. The dashed lines on either side of the main arrow show the accuracy of the internal compass.